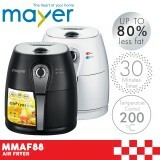 Deep frying with 80% less oil Rapid Air Circulation Technology that allows using little or no oil when cooking 30 minutes timer function 200 Degrees Celcius Temperature Control Warranty: 1 Year ..
Mayer MMAF88 Airfryer (3.5L) Say NO to oily food and save yourself from the unhealthy oils, heat and the messy cleaning; which you can done it with airfryer with ease, it simple and easy to use. 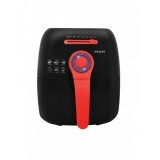 Now you can easily fry any deep fried treats without using much oil. Th..